China reportedly spent more on the Shanghai Expo than it did on the Olympics. This is surprising since the Beijing Olympics were generally regarded as over the top, excessive, and the most expensive Olympics ever. It seems ludicrous to spend more on an event that most people don’t know still exists. I mean, can you remember where (or even when) the last World Expo was held? 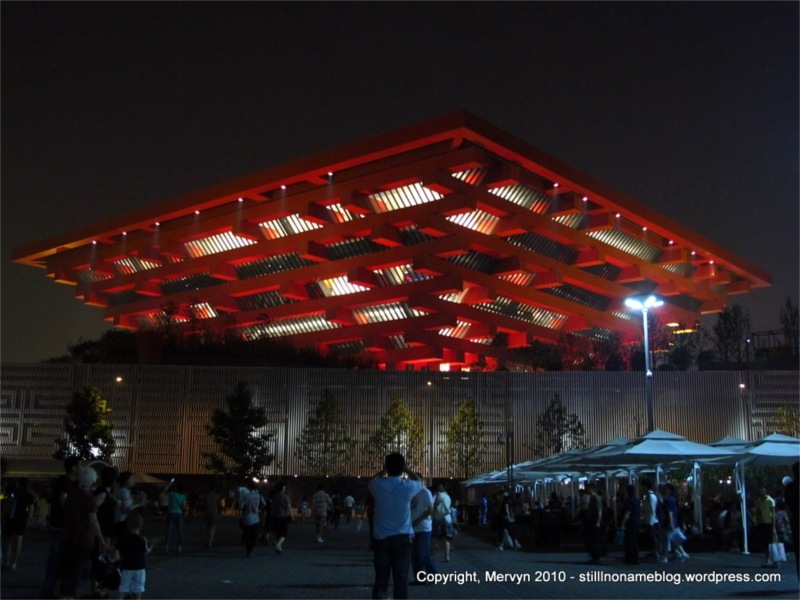 Regardless of the world’s awareness, the Expo is a big deal in China. In cities all around China, there are giant digital displays showing how many days the Expo’s been running. The 2010 mascot–think Gumby of (non-Yao Ming) Chinese stature–is plastered all over subways, buses, and buildings and features prominently in a disturbing number of TV commercials. 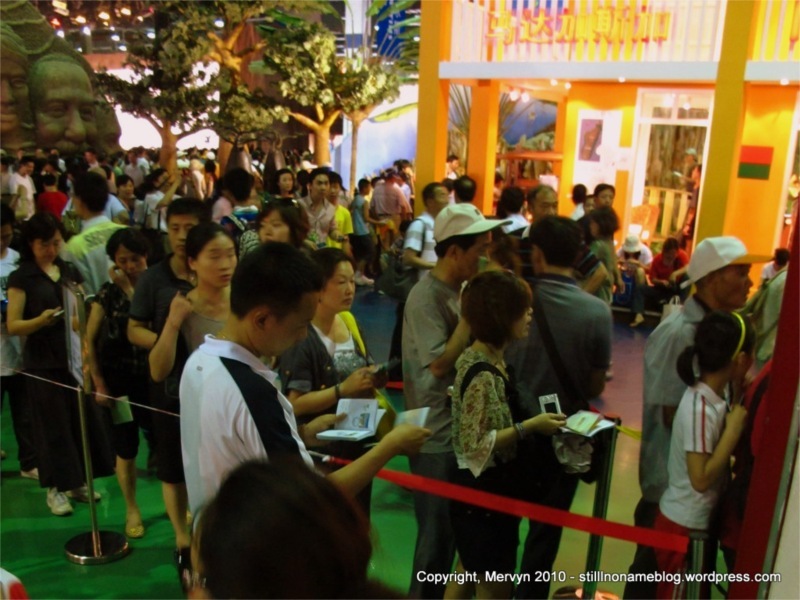 When you visit the Expo like I did today, you find throngs of Chinese people. 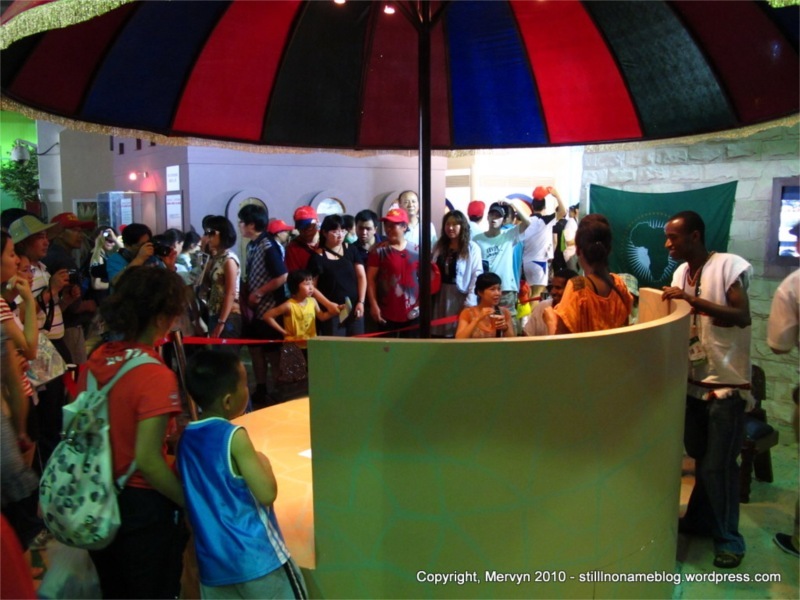 There are conversely few foreigners who are not Expo volunteers. 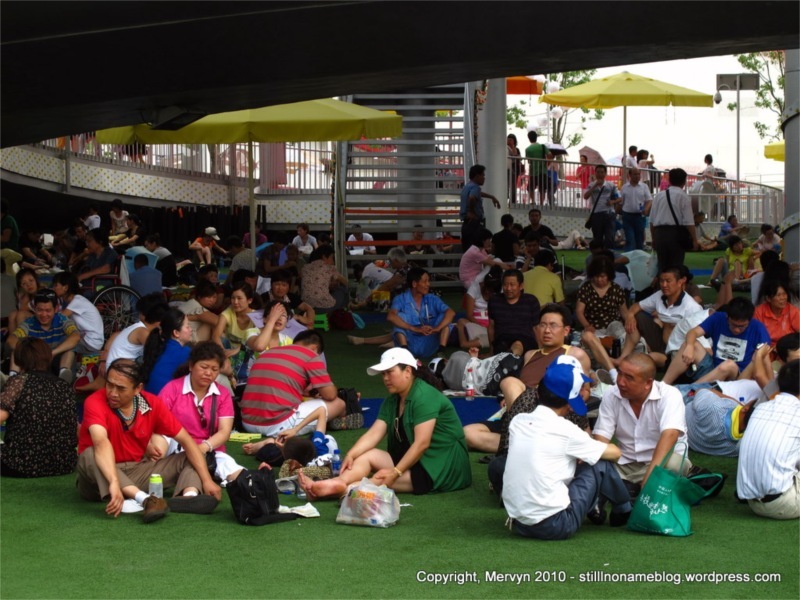 Everywhere I looked, Chinese people were sitting in the shade of buildings, standing in three-hour lines to pavilions, and munching on foreign fare. The Expo complex straddles two sides of the Huangpu River, just down from the historic Bund and the high rises of Pudong. It’s crammed with all manner of structures. 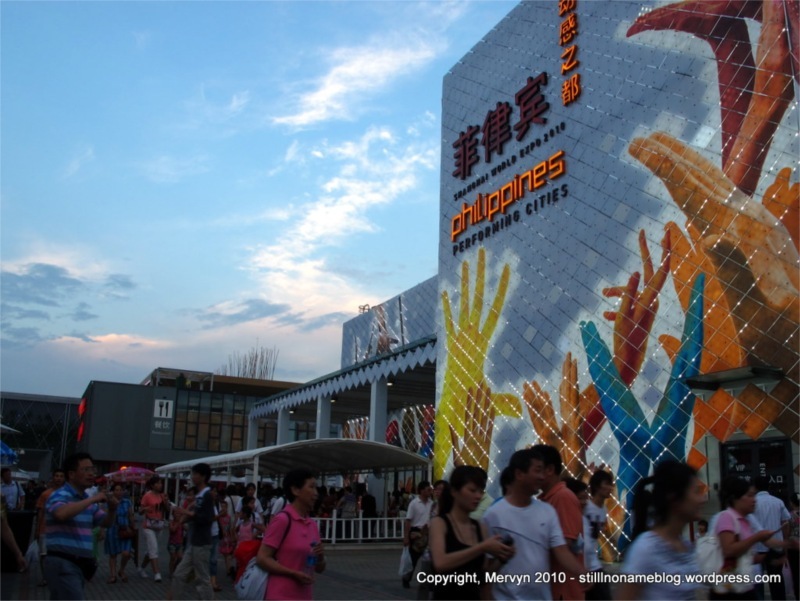 One side of the river is devoted to extolling Shanghai and modern China. The other is filled with exhibits from around the world. Some countries have constructed their own pavilions—permanent structures that, as far as I can tell, will never be used again. Other countries, mostly the smaller ones, have booths in jammed convention halls. 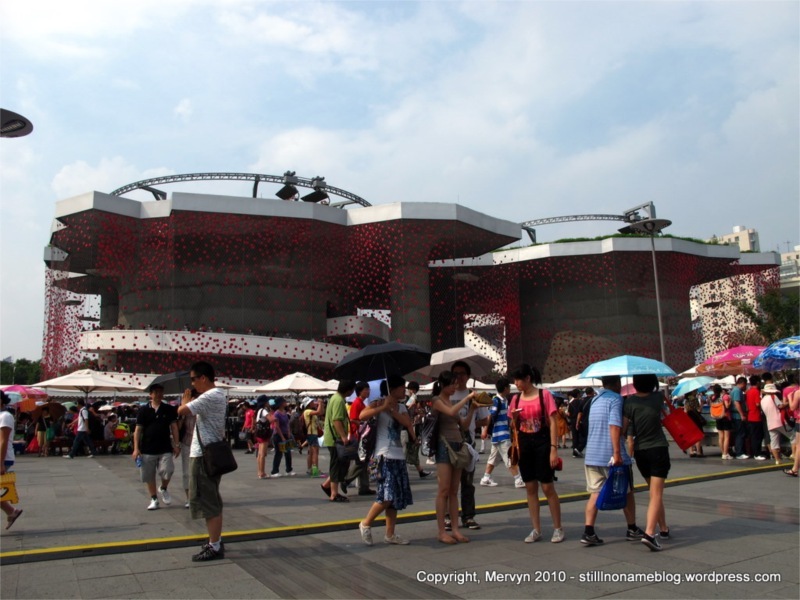 For those that have their own pavilion, the structure is of the country’s own design. Some are fantastic. The Spanish pavilion looks like it’s layered with fish scales made of burlap and is mildly reminiscent of the Sagrada Família in Barcelona. The Swiss pavilion has a working ski lift and glitters with dangling red disks. The giant black rock that looks like it’s bursting with lava is the Portuguese pavilion. The Brazil pavilion features a giant TV on the front replaying Brazil’s win in their most recent World Cup game. 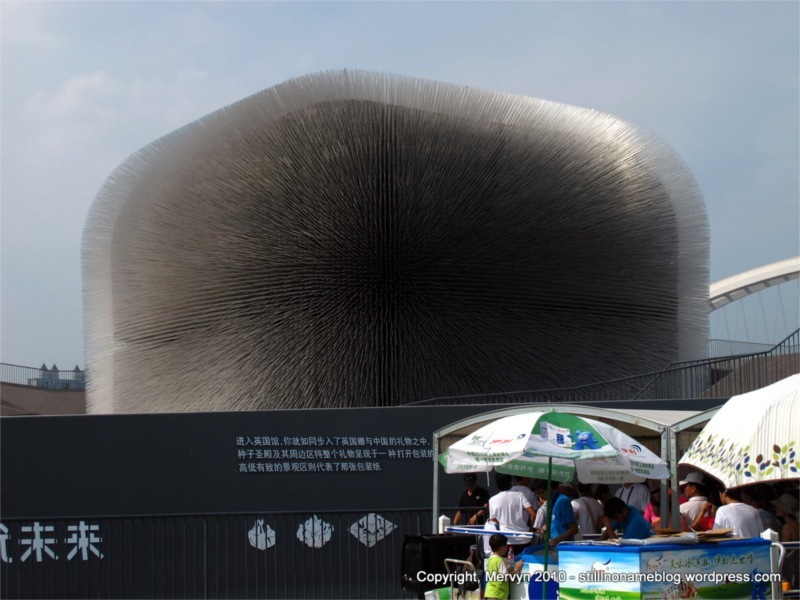 Looking at the UK pavilion makes you think you have some sort of eye disease. 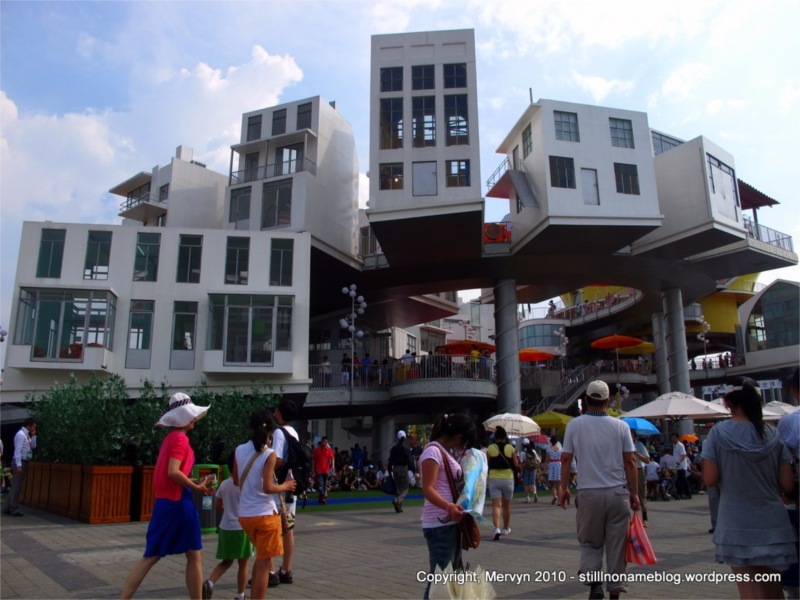 One of my favorites is the Dutch pavilion, which looks like a series of floating houses. Most stand alone pavilions were interesting architecture. Definitely fun to look at. 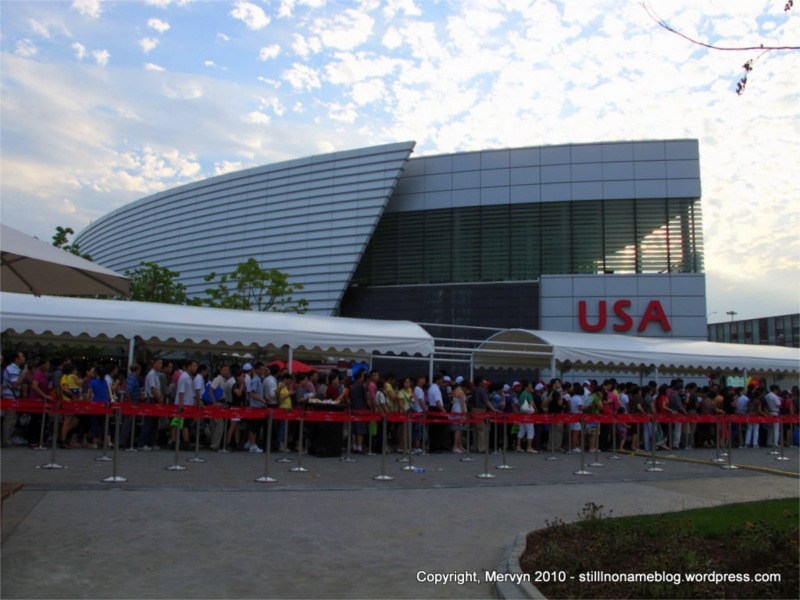 The most disappointing pavilion by far, though, is the USA pavilion. As Doug described it when I had lunch with him yesterday, it looks like a gray Costco. This is sad for Americans because it’s a boring building and because it’s design is all too appropriate. Leave it to the U.S. sponsors to exhibit our culture with a featureless warehouse superstore where you can buy a bag of Rice-a-Roni big enough to feed a small Chinese city for a week. As impressive as the pavilions’ exteriors were, the interiors were just as disappointing. Most had a tourism or business promotional movie and some pictures. Some managed to display some interesting cultural artifacts. Most gave you little sense of what the country was actually like—though Cuba seemed to be doing gangbusters selling mojitos. Almost none had people on hand to answer questions about the country. Many of the information desks were manned by Chinese volunteers. If I were running a pavilion and wanted to put my best foot forward, I’d stock the place with warm, friendly citizens who spoke a variety of languages. When I walked into the Czech pavilion, for example, I expected to be greeted by smiling, leggy, blond supermodels. There were none, not even leggy Czech men. The one Czech person I saw was sequestered behind the bar with a bunch of Chinese in the glass encased restaurant adjoining the pavilion. I couldn’t even see below her waist to assess leg length. Appalling. It’s going to sound like I’m a homer, but the Philippines had the best interior display. 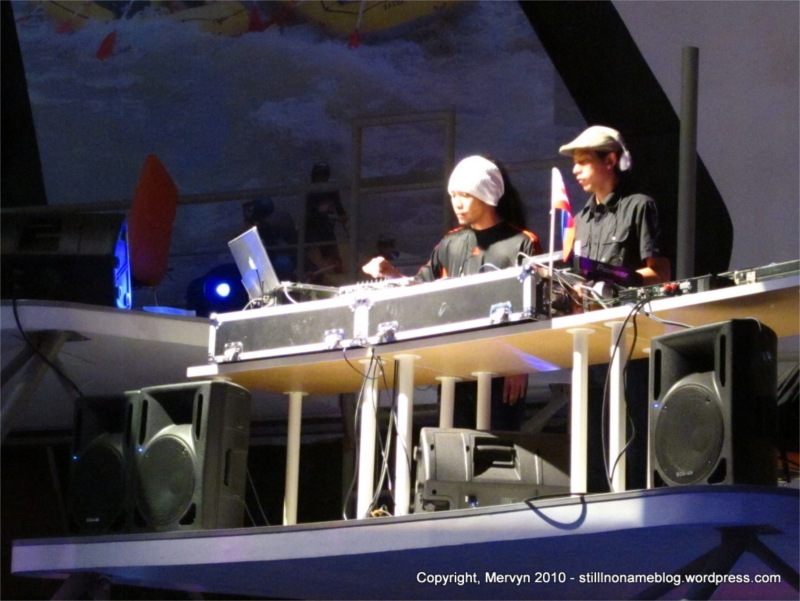 In the spirit of Filipinos’ love of all things entertaining, they had a Filipino rasta DJ spinning the best music I’ve heard spun since I arrived in China. 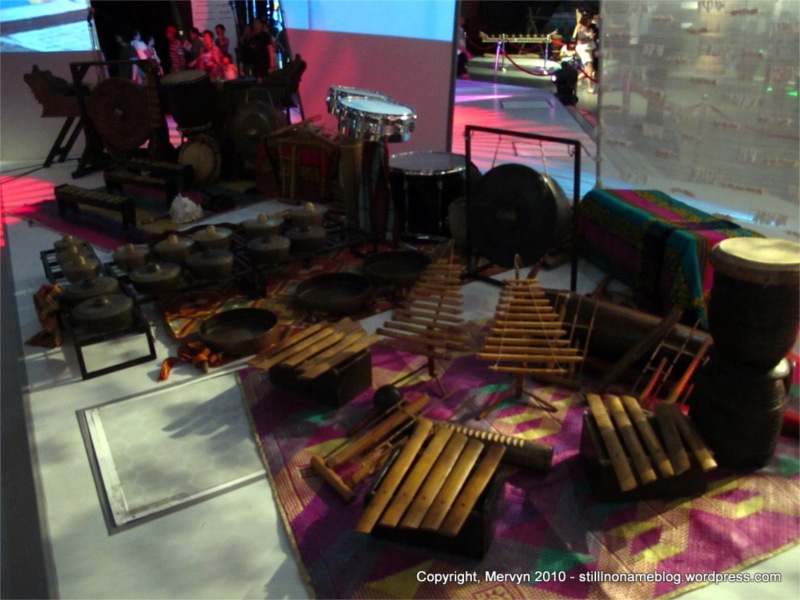 Nearly all the displays exhibited a love of performance art—drums, guitars, pianos, and other instruments. There were actual Filipinos working the counters and desks. All were warm and friendly. They had a booth giving out traditional (non-happy ending) Filipino massages. 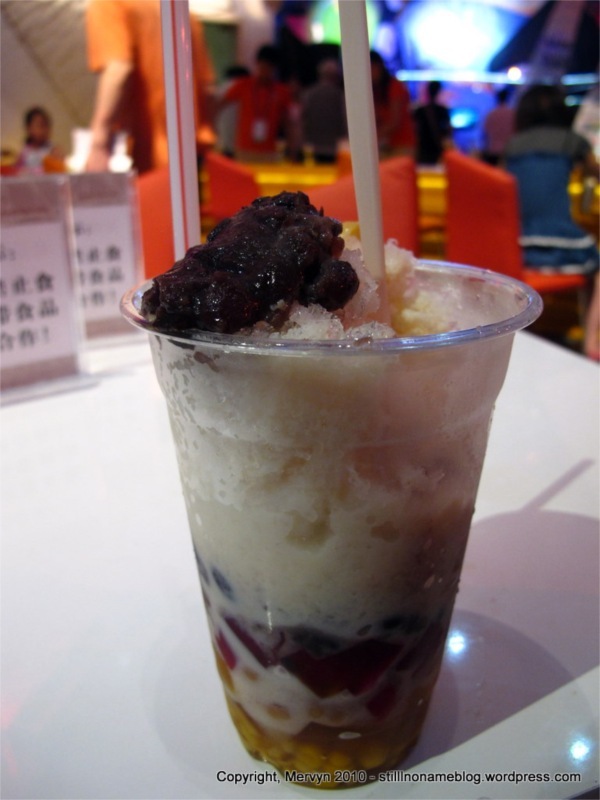 I was so happy with the place I sat down and had a cup of hal- halo. It’s indulgences like this that have my mother thinking that I’m fat. The Philippine pavilion capped off what was a sometimes frustrating day. 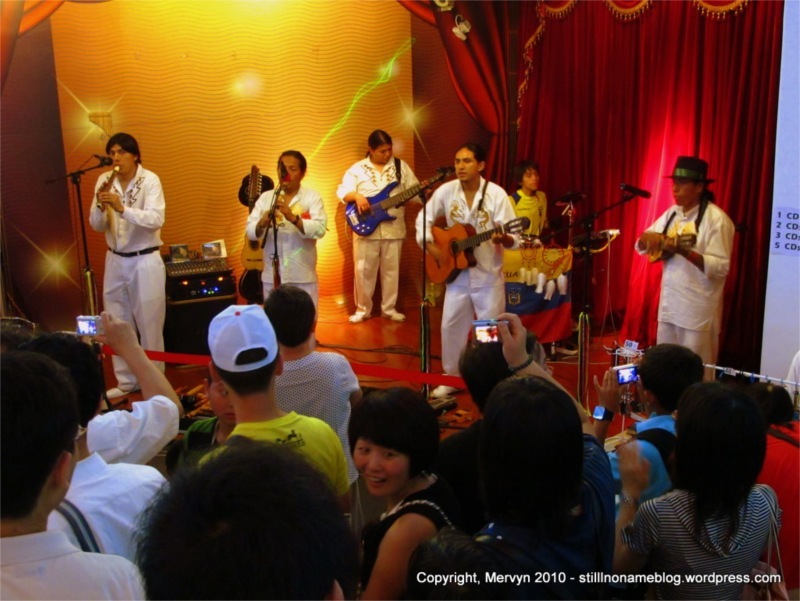 The crowds and queues with Chinese people highlighted what foreigners find frustrating about Chinese culture. Lots of pushing, yelling, cutting in line, and spitting. Pavilions used to have special lines for elderly and disabled. Most countries shut them down because people were procuring wheelchairs, faking injuries, and then getting their whole clan to the front of the line. One of the Expo gimmicks are fake passports that you can buy and get stamped at every pavilion and booth, sort of like you actually visited the countries represented. The Chinese are mad for these. People will buy passports up from the official shops at the beginning of the day and resell them at inflated prices. Fully stamped ones are selling on China’s eBay for few a hundred dollars. Each pavilion has some foreign volunteer, sometimes in national costume, impassively stamping thousands and thousands of these things. Sometimes they’re the only foreign representative in the place. I tried to talk to one of them. She brightened up visibly and tried to answer my question about the fish in the display, all the while stamping passports of Chinese people shoving past each other. I felt sorry for her. It’s one of those jobs where the worker probably wouldn’t mind if she lost her job to a machine. After a few hours, I’d had my fill of Chinese tourists. At one point, a little boy slipped past me in the Peru queue (that’s really fun to say, by the way—Peru queue!). I knew what was coming next. I felt a tap on my shoulder and a Chinese woman said something, presumably asking to get by me so that she and the rest of her family could follow her son to the front. Without even turning around, I boxed her out, gestured with my thumb, and told her that the kid could go back. I’m sure she had no idea what I said, but she didn’t protest. Unfortunately, the line widened and she and the rest of her clan shot straight past me to the front. I fumed for a minute, then realized I needed to mellow out. It didn’t help it was the first hot, non-rainy day in Shanghai. My arms were sheeting sweat even though I was standing motionless in the shade. To take the edge off, I opted to sample some of the ethnic beers and food. 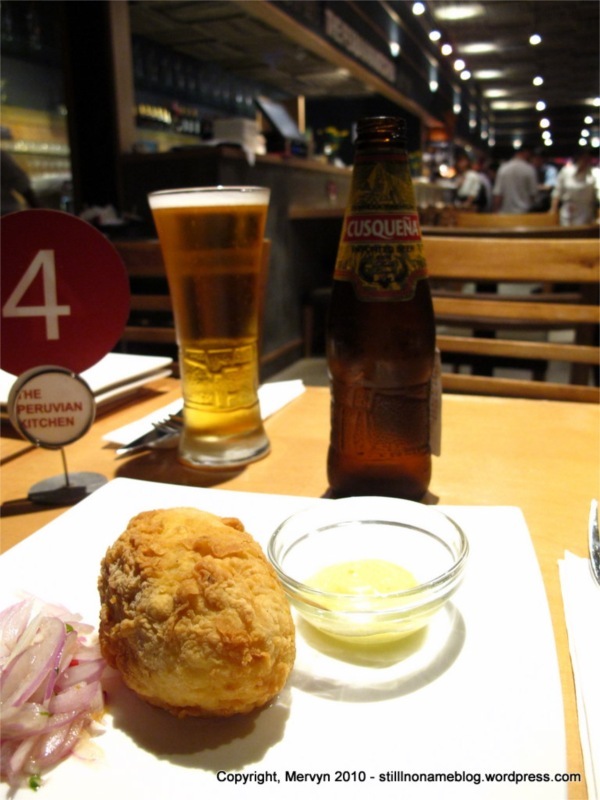 Peru provided a nice snack of potatoes stuffed with meat (a sort of fried ball of shepherd’s pie). That, and a Cusqueña later, I felt refreshed. Argentina helped with a dose of Quilmes. Hydrated, full, and quite a bit cooler on a number of levels, I wandered the pavilions till after dark. 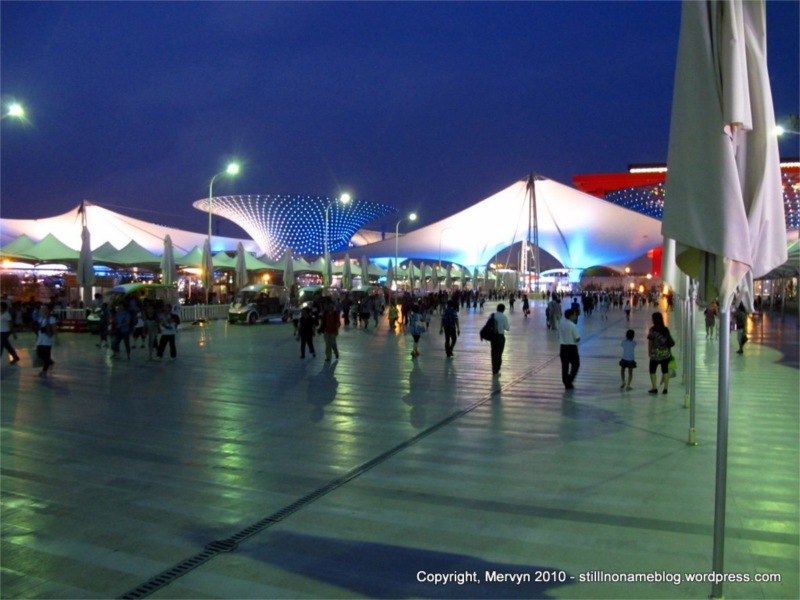 Final verdict: Shanghai Expo 2010 is basically Epcot Center in Florida except with less information and activities. It’s geared towards Chinese more than anything else—people who won’t travel much. For them, the Expo serves as a handy stand-in for the real thing. The buildings are fantastic and worth a look at, regardless of your travel experience. And the food and drink can be a godsend after a few hours shoulder to shoulder with the locals. 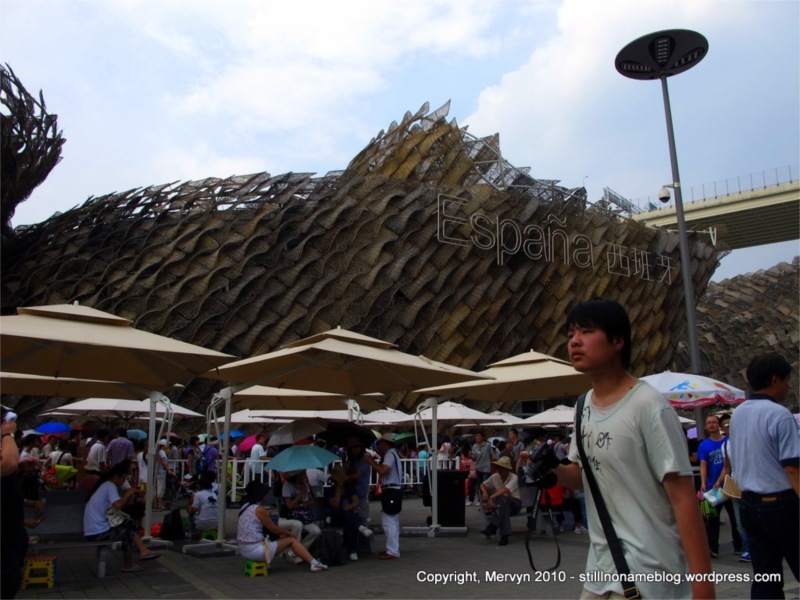 GALLERY: Pictures of more pavilions (including Mexico’s fascinating offering), crowds, food, and Chinese people gawking at Black people. You’re totally biased. 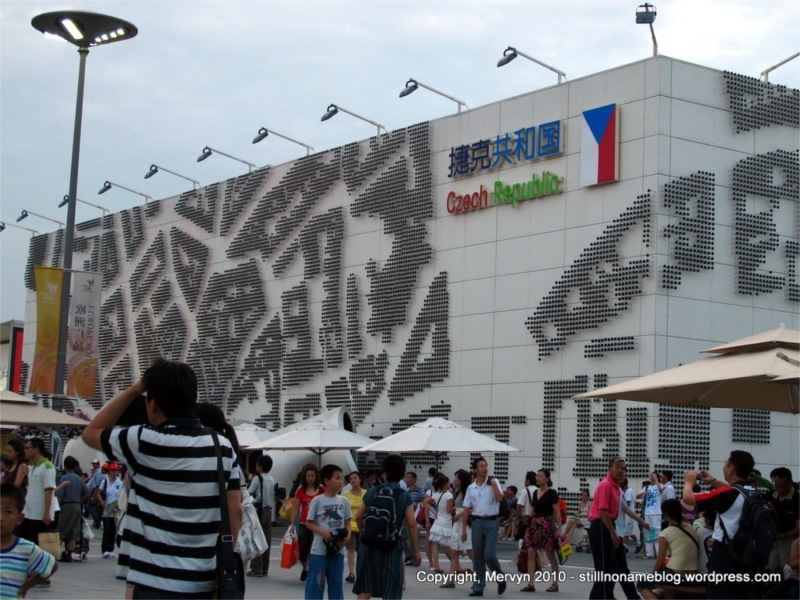 The outside of the Philippines building looks like a colored version of the parking structure at the San Jose airport. I didn’t say the outside was compelling. I said the inside was the most entertaining. Better than a boring movie, a lame artifact, and some bored Chinese people selling trinkets.